And what a first meeting it was! We could not have hoped for a better turn out or more enthusiastic quilters. People came who had signed up for our newsletter at the Fibrations event (or Fabric Vibrations as someone called it last night! ), people who saw one of our leaflets around town, some came with a friend, the private quilting group "The QT Quilters" came, and people who heard of us through word-of-mouth. There were people who live from Sooke to Sidney and everywhere in between. A special shout out to Pat! who came all the way from DUNCAN to be at the inaugural meeting. And the skill levels ran the gamut from "I've never made a quilt but I sure like the look of modern quilts" to people who've been quilting for decades. 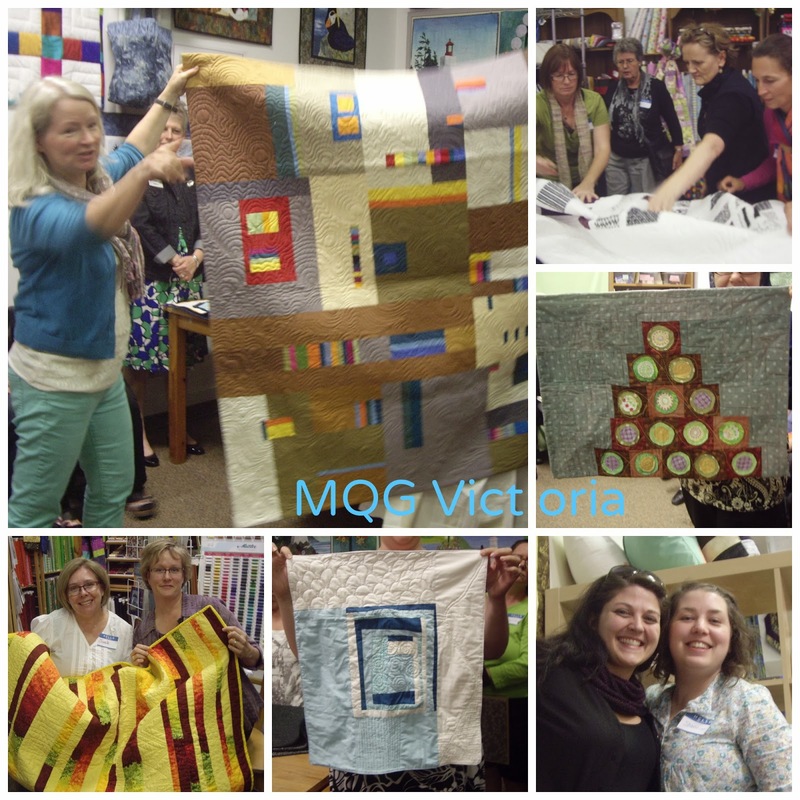 All of us were there to celebrate and enjoy modern quilts. There was also a lively discussion about whether there is a need for written patterns for modern quilts. The consensus was that YES, there are benefits to patterns. "It does the math for me" was one opinion, and "gives me ideas how to quilt it" was another. Also patterns can help newer quilters who are still developing their skills. Some of the quilts, some of the people. From here it was a natural segue into show and share. And not just sharing, but discussing the quilts too. How Kimberly repurposed her husband's shirts to make a hand quilted doll quilt for her daughter, how Brenda took some not-so modern fabric scraps and set them in a clear modern setting, the combination of solids and dense free motion quilting paired with conventional dimples and batik fabrics, how to re-imagine a bargello in a modern way, and so on. Every quilt has a story and an idea behind it. 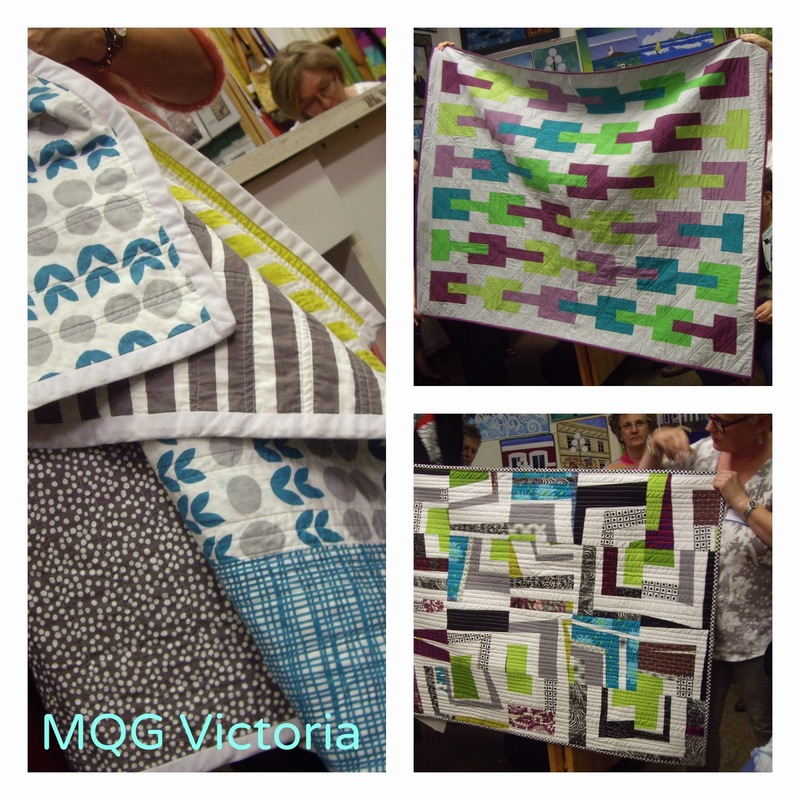 After we shared the quilts we gave out door prizes, we enthusiastically cheered the news of our next meeting (Thursday, Oct. 17th 7pm at Satin Moon), and then officially ended the first Modern Quilt Guild Victoria meeting. Most everyone stuck around for refreshments, and fabric buying, and visiting friends new and old. So there we have it, a rousing success to our first meeting. We hope that you will come to our next one. See you soon, and happy quilting. What a great first meeting- we ha a ton of fun! Can't wait till next month!! Thanks for coming Kim, it was lovely meeting you. See you in October! The meeting looks like it was a great success.....so sad i wasn't able to be there! !